A group of researchers from the UK, including academics from Cardiff University, has demonstrated the first practical laser that has been grown directly on a silicon substrate. It is believed the breakthrough could lead to ultra-fast communication between computer chips and electronic systems and therefore transform a wide variety of sectors, from communications and healthcare to energy generation. The EPSRC-funded UK group, led by Cardiff University and including researchers from UCL and the University of Sheffield, have presented their findings in the journal Nature Photonics. Silicon is the most widely used material for the fabrication of electronic devices and is used to fabricate semiconductors, which are embedded into nearly every device and piece of technology that we use in our everyday lives, from smartphones and computers to satellite communications and GPS. Electronic devices have continued to get quicker, more efficient and more complex, and have therefore placed an added demand on the underlining technology. Researchers have found it increasingly difficult to meet these demands using conventional electrical interconnects between computer chips and systems, and have therefore turned to light as a potential ultra-fast connector. 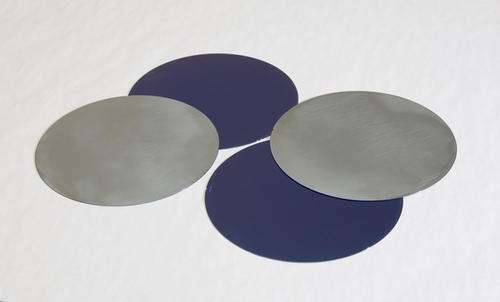 Whilst it has been difficult to combine a semiconductor laser - the ideal source of light - with silicon, the UK group have now overcome these difficulties and successfully integrated a laser directly grown onto a silicon substrate for the very first time. Professor Huiyun Liu, who led the growth activity, explained that the 1300 nm wavelength laser has been shown to operate at temperatures of up to 120°C and for up to 100,000 hours. Professor Peter Smowton, from Cardiff University's School of Physics and Astronomy, said: "Realising electrically-pumped lasers based on Si substrates is a fundamental step towards silicon photonics. "The precise outcomes of such a step are impossible to predict in their entirety, but it will clearly transform computing and the digital economy, revolutionise healthcare through patient monitoring, and provide a step-change in energy efficiency. "Our breakthrough is perfectly timed as it forms the basis of one of the major strands of activity in Cardiff University's Institute for Compound Semiconductors and the University's joint venture with compound semiconductor specialists IQE." Professor Alwyn Seeds, Head of the Photonics Group at University College London, said: "The techniques that we have developed permit us to realise the Holy Grail of silicon photonics - an efficient and reliable electrically driven semiconductor laser directly integrated on a silicon substrate. Our future work will be aimed at integrating these lasers with waveguides and drive electronics leading to a comprehensive technology for the integration of photonics with silicon electronics." How can they have proven it to work for 100,000 hours when the whole invention didn't even exist 11½ years ago? Build a million of them and chart failure rates. Statistics will tell you the rest. IMO they're doing accelerated tests at higher temperatures and extrapolate the result for lower, still acceptable temperature. If you have a million eggs sitting pretty for ten days, does that show the eggs will stay edible for 100 days? or 1000 days? Of course it doesn't. MTBF estimates and accelerated aging tests are not proof of lifetime. The only actual way to show and prove that something works for 100,000 hours is to run it for 11 and a bit years. Superfast computing is good. Application of this speed to control of fast breaking unstable plasmas in a fusion reactor is even better, like a marriage made in heaven of technologies barely dreamed of a scant fifty years ago.